It’s not often you get the opportunity to traverse the entire state of Utah, but when you do you should probably stop for Crown Burger. Or so I hear, but unfortunately that place doesn’t exist south of Salt Lake City. 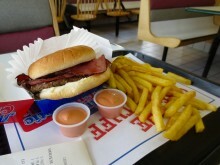 Yet through the magic of the internet I learned that Crown Burger is not the only place in Utah to serve pastrami burgers and one of the alternatives was Arctic Circle, which I found in Cedar City. The pearly gates of Utah. I have a coworker who has a problem. The problem is she is a vegetarian. Gross, right? But not by choice. You see she is lacking the enzyme that breaks down meat in her body, so the simple act of eating meat makes her violently ill. It’s really the only acceptable form of vegetarianism, yet there is one place she will always eat meat, stomach be damned. That place is Cafe Rio. It’s a seemingly generic Mexican place that I have driven past many times in Manhattan Beach and brushed off. But little did I realize that Cafe Rio is huge in Utah. Like real huge. And it’s about to get even huger. 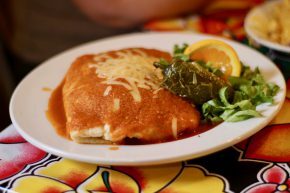 There are currently 40-something locations, but they are planning an expansion on the scale of 100 restaurants. 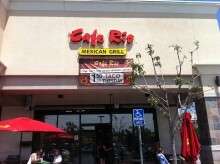 So when one opens across the street from you, remember you read about Cafe Rio on The Unvegan first. With my coworker in mind, we finally stopped at Cafe Rio to what all the meat fuss was about.